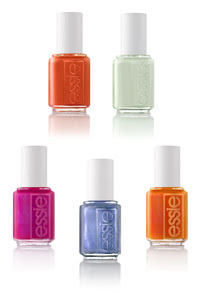 ESSIE is about to introduce its new Summer Collection which includes a selection of neon bright nail polishes. Shades on offer include Braziliant (Orange), Too Too Hot (Red), Meet Me At Sunset (Pink), Auper Bossa Nova (Magenta), Absolutely Shore (Aqua) and Smooth Sailing (Blue). Essie cosmetics products do not contain Formaldehyde, DBP or Toluene. The new Essie Summer 2011 collection will be available in selected salons from 1 June priced individually at £9.95.